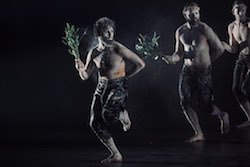 BANGARRA DANCE ENSEMBLE IN 'NGATHU'. PHOTO BY DANIEL BOUD. 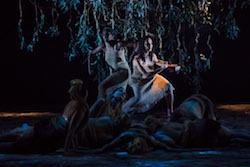 A most exciting triple bill by Bangarra Dance Theatre, three world premieres combined under the umbrella title of ONE’S COUNTRY, taking us from North East Arnhem Land’s red dust, to the waters of the Torres Strait Islands – home of the salt-water creature, the Dugong – to Indigenous urban life looking at gender challenges and the human spirit. This is the second time Bangarra has performed at Sydney’s Carriageworks. The trademark Bangarra style is evident with the blend of traditional Aboriginal/Torres Strait Islander dance and contemporary. Beau Dean Riley Smith in ‘Ngathu’. Photo by Daniel Boud. 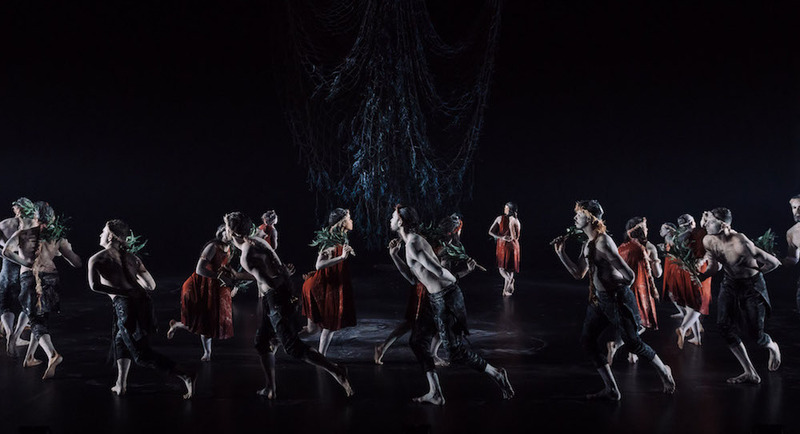 The first work was Ngathu by Djakapurra Munyarryun, a respected Yolngu songman from Dhalinybuy in North East Arnhem Land who has worked in many Bangarra productions as a dancer, musician, singer and cultural consultant. It is inspired by the ngathu (cycad) nut, which only appears for a fleeting moment before the wet season. We see the dancers – the women in red costumes, the men in black – with traditional red eye makeup, travelling to the harvest, gathering and sorting the nut and finally roasting it over coals as the wet finally arrives. Deborah Brown and Yolanda Lowatta in ‘Ngathu’. Photo by Daniel Boud. Ngathu opens with a dreamlike sequence of two women materialising from behind the set who carry a wooden bowl and collect their dilly bags from the floor. This work was the one that had the most obviously traditional first people’s choreography. It included pulsating traditional music with didgeridoo. Choreographically, one moment it was contemporary with slithery floorwork and rolling turns, almost breakdancing at times, and then it became the traditional dances with emphatic foot stamps, circular walks, fast furious low jumps and arms held low and crossed. The second, fabulously danced, work was Place by dancer Kaine Sultan-Babij. This is his first choreographic work for Bangarra. Grounded by his clan, his heritage and his family totem of the caterpillar, we are transported to the concrete jungle of an urban Australian setting, drawing on his personal experience to explore what it means to be black and gay in today’s world – while he is supported by family, yet there is a huge aura of loneliness as a young black gay man. Leonard Mickelo in ‘Place’. Photo by Daniel Boud. There are several fences used both as a barre and as barriers. At one point, some of them have coldly futuristic strips of fluorescent lighting. The opening is very contemporary in style with the six dancers in black struggling to break through the barriers. The choreography for the piece was quite demanding and requires a very flexible back. There is lots of rolling, slithery, undulating floorwork and also headstands! At one point, there is an aura as if the ensemble is mistily wheeling or floating. Two highlights include a sensational duo for Tyrel Dulvarie and Yolanda Lowatta, which is sinuous and delicate with some striking lifts. And the final mesmerizing solo for Leonard Mickelo, who was hypnotic, full of fluid, inky pantherine movement in space on, around and over the barrier. Elma Kris and Nicola Sabatino in ‘Whistler’. Photo by Daniel Boud. 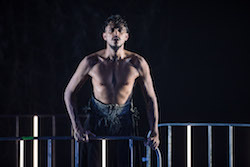 The final work was Whistler, a story inspired by the sacred call of the dugong and its significance to their people, created by Bangarra dancers and proud Torres Strait Islander women Elma Kris and Nicola Sabatino. For some of the work, the dancers gracefully slide and pull themselves around on their hands, with their legs dragging behind them, with aquatic behaviour. Dugongs are generally regarded as rather strange looking creatures, with large heads, cumbersome paddle-like flippers and a cumbersome way of sauntering through the water. But in Whistler, we see them with rare dignity and grace. They writhe sculpturally, play; they slither over and under each other, and they roll around in the chalk dust of the stage enchantingly. Are they dugongs, as we are informed in the program? Or mermaids? Or seals? At one point, they undulate and pulsate like coral; at another, they are fluid and darting. There are some very demanding lifts in a striking, sinuous pas de deux. The men have some wonderfully spiny textured headdresses, the women long, high blonde headdresses. Yolanda Lowatta and Beau Dean Riley Smith have a delightfully energetic duo. The final rousing ensemble was a return to traditional First Peoples songs and dances.